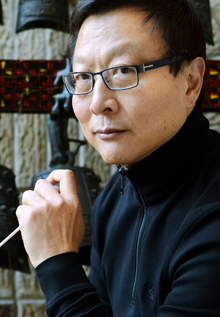 The MacArthur Fellow Bright Sheng was born on December 6, 1955, in Shanghai, China, and moved to New York in l982. He is currently the Leonard Bernstein Distinguished University Professor at University of Michigan, and Y. K. Pao Distinguished Visiting Professor at Hong Kong University of Science and Technology. Sheng has collaborated with such distinguished musicians as Leonard Bernstein, Kurt Masur, Christoph Eschenbach, Charles Dutoit, Michael Tilson Thomas, Leonard Slatkin, Gerard Schwarz, David Robertson, David Zinman, Neeme Järvi, Robert Spano, Hugh Wolff, Yo Yo Ma, Emanuel Ax, Gil Shaham, Yefim Bronfman, Lynn Harrell, Peter Serkin, Chao-Liang Lin, Evelyn Glennie, among others. He has been widely commissioned and performed by the top musical institutions in North America, Europe and Asia, including the White House, the 2008 Beijing International Olympic Games, New York Philharmonic, Boston Symphony Orchestra, Cleveland Orchestra, Chicago Symphony, Philadelphia Orchestra, San Francisco Symphony, LA Philharmonic, Minnesota Symphony, Royal Concertgebouw Orchestra, Orchestra de Paris, BBC Symphony, Hamburg Radio Symphony, Danish National Symphony, San Francisco Opera, Lyric Opera of Chicago, Santa Fe Opera, New York City Opera, New York City Ballet, and San Francisco Ballet. Exclusively published by G. Schirmer Inc. in New York City, he has album releases on Sony, Decca, and 11 exclusive discs on Naxos, Talarc, Delos, Koch International, New World labels, and Grammofon AB BIS. His music ranges from dramatic to lyrical, and is strongly influenced by the folk and classical music tradition from eastern and central Asia. Since 2000, he has been studying and researching the music phenomenon of the Silk Road culture, and has also has served as the Artistic Advisor to Yo Yo Ma's Silk Road Project Inc.
As a conductor, he has worked with the San Francisco Symphony, Detroit Symphony, Seattle Symphony, Hong Kong Philharmonic, Shanghai Symphony, St. Petersburg Philharmonic in Russia, Dortmund Philharmonic in Germany, China National Symphony, among others, and has appeared at Carnegie Hall, Lincoln Center, Kennedy Center. Since 2011, he has been the Founder and Artistic Director of The Intimacy of Creativity — The Bright Sheng Partnership: Composers Meet Performers in Hong Kong, an annual two-week workshop with new approach to creativity.